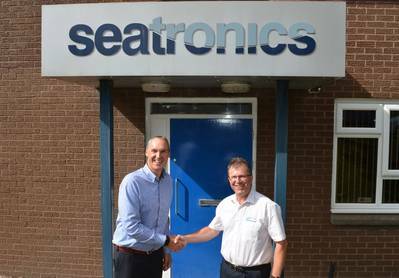 Seatronics, an Acteon company providing rental and sale of marine electronic equipment, has doubled its stock of Sonic 2024 Multibeam Echosounders with the acquisition of 11 new systems from long-term supplier R2 Sonic. Over the last 18 months, the increased projects within the oil and gas industry and the booming activity in the offshore wind farm sector have seen a rise in hydrographic surveys all around the world. Responding to this increased need and to serve their customers with innovative solutions, Seatronics have more than doubled their stockholding of Sonic 2024 systems with an investment in excess of $2 million. The Sonic 2024 is a broadband - wideband high resolution shallow water multibeam echosounder. It provides user selectable operating frequencies between 170kHz and 450kHz with 1Hz increment, and optional 700 kHz. It offers a beamwidth of 0.3° x 0.6° at 700kHz. In addition, like all R2Sonic MBES, the Sonic 2024 is equipped with the Ultra High Density (UHD) feature which increases the number of soundings per ping by 400 percent to 1024. Also, the Sonic 2024 provides variable swath coverage selections from 10° to 160°, the ability to rotate the swath sector, as well as roll stabilization. Both the frequency and swath coverage may be selected ‘on-the-fly’, in real-time during survey operations. The compact size, low weight, low power consumption of 50W and the elimination of separate topside processors make the Sonic 2024 very well suited for small survey vessel, ROV or AUV operations. Seatronics are official representatives for R2 Sonic in the Middle East region working collaboratively to provide service and local support. The Sonic 2024 Multibeam Echosounders are available globally to rent or purchase from Seatronics' bases in Aberdeen, Houston, Singapore and Abu Dhabi.